A gondolier holding a panino, someone dressed in Carnevale costume, laundry hanging from the window, and the canal. Could a more Venetian scene exist? 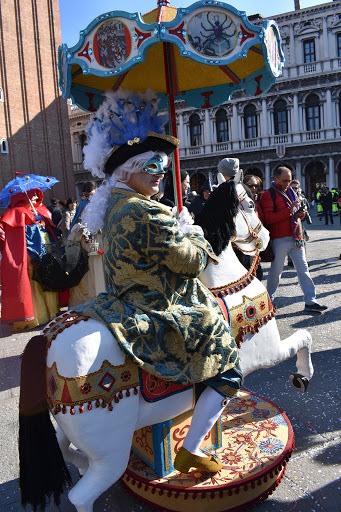 When I managed to find reasonably priced bus tickets to Carnevale, I knew I couldn’t pass up the opportunity of seeing the Venetian tradition in person…even if it did mean waking up around 3:00am. With less than three hours of sleep, Emily and I woke up for our first day trip of the semester. Out the door by 4:15, we walked the streets with locals and study abroad students making their way home. It felt really strange to start my day as their’s was ending. Once we got the Santa Maria Novella Train Station, we had another ten minutes or so to walk before we got to the FlixBus stop. I was especially happy that I had decided to find the stop the day before–if seemed even more remote and obscurely located under the light of the moon. As we waited for the bus, I was filled with a mix of excitement and disbelief. We were actually going to Venice…during Carnevale! The bus ride was just over four hours and was a much better than my first experience with MegaBus, FlixBus’ American counterpart. I might not have slept during the first leg of the trip, but I was able to catch a couple hours of sleep from Bologna onwards. Around 9:15, the bus dropped us off at Venice Mestre Station, where I paid way too much money to use the bathroom. While I appreciate how clean Europe’s public restrooms are, I still scoff at paying a price to pee. 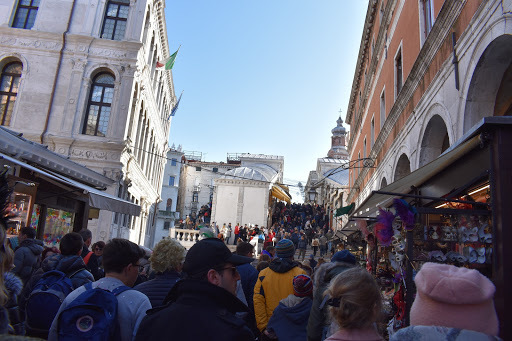 Getting tickets from Mestre into the center of Venice was incredibly easy, despite how long it was taking everyone in front of us to make their purchases. As we got our tickets, a Venice bound train pulled into the station! We quickly realized that there weren’t times on the tickets and that we could catch that train if we hurried. Luckily, I had read far too many blog posts around the Italian train system to forget to validate our tickets. After validating, we boarded the train–ten minutes later we were in Venice. I was so excited to be there that I don’t really remember getting off the train. 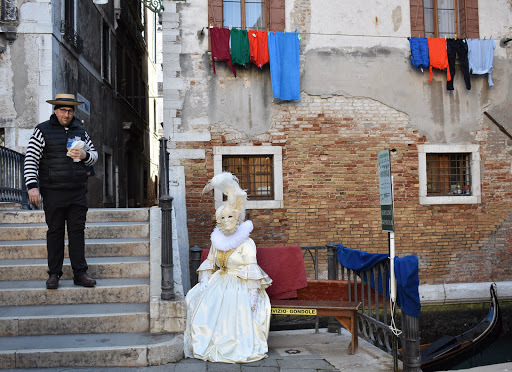 In the station, I caught my first glimpses of people in costume and was temporarily alarmed…until I remember the whole reason we were in Venice. 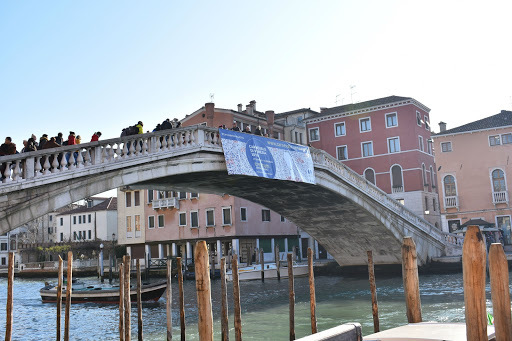 The bridge over the Grand Canal greeted us as we started our day. Elaborate costumes, the stunning grand canal, and hundreds of masks being sold from street side stands entered my vision. The first order of business was finding food; everything was a little less overwhelming after eating. Martina putting the finishing touches on my mask. The second goal was to find masks, as we had quickly decided that a handmade mask would mean a lot more personally and culturally than to purchase a cheap mask from a gift shop. Finally, we found a shop with beautifully decorated masks…that were in our price range. 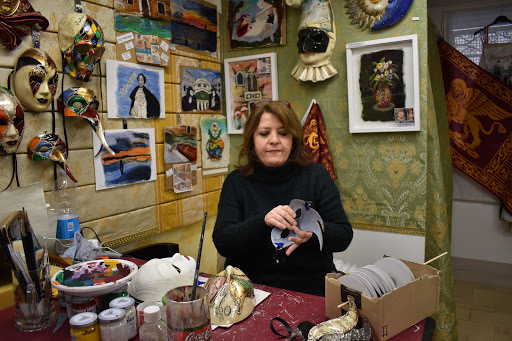 Martina Fantuzzo, the artist, handcrafts her masks in the shop. In fact, she even added a few finishing touches once we decided which masks we wanted to purchase. Bigger crowds around every corner! As we wandered Venice’s confusing streets, we knew we were getting closer to San Marco Square solely based on the crowds. My favorite costume of the day…although it was hard to pick! San Marco was a sea of people in costumes flaunting as they drank coffee and posing for pictures. My favorite was someone dressed as a man on a carousel horse. There was a little snag in the fun as we hunted for a bathroom (which I urgently needed) and then a place to eat lunch. We tried to avoid the overpriced, touristy wine, but ended up at an empty, diner-quality restaurant. Lesson learned: sometimes paying a little bit more for food is worth the money. As the sun started to set, we became tired and cold, deciding that a cup of hot wine would solve our problems. We might have warmed up, but then we ended up in a pay-by-the-pound style candy store. I spent 7€ (almost $10 US) on a handful of jelly beans, a chocolate covered ginger nugget (? ), some stale licorice wheels, and a large sour watermelon rope. Not my proudest moment. At this point in the day, we were pretty much done with walking around; we had seen enough. I knew a friend from class was going to be in Venice, so we tried to meet up with her. It was a failed attempt. Who knew a city could be so confusing? 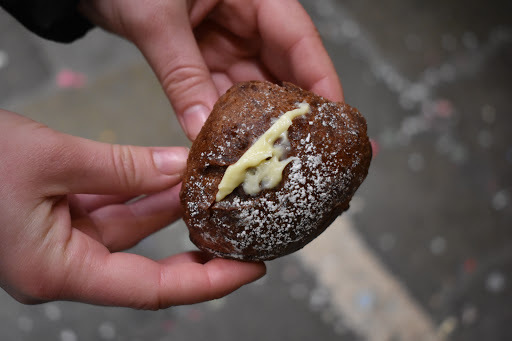 We split a frittelle, the Venetian doughnut-like pastry only made during Carnevale, and moved on as it was almost time catch the train anyway. I couldn’t find our station on the departure board and figured that it was because it wasn’t the train’s final stop. We popped into the TrainItalia office to find out our platform, but truly couldn’t grasp that the train there was actually going to take us where we needed to be. Once we boarded the train and some Italian’s questioned the same thing, we weren’t feeling much better. Luckily, the train stopped at Mestre and we arrived at the bus pickup spot with perfect timing. We finally arrived home at 2:00am, after a twenty-two hour adventure. Carnevale was such an amazing cultural experience, as even Italian’s flock to Venice as tourists to experience the spectacle.